On a hot September Sunday in 1946, citizens and honored guests gathered at the corner of 5th Avenue and Oak Street in this western suburb of Chicago. In attendance was the Governor of Illinois, as well as Brigadier Generals and Navy Commandants. But the true guest of honor on September 8, 1946 was a tank, sent from Minnesota to Maywood to be used as a permanent memorial to the men of Maywood’s Co. B of the 192nd Tank Battalion. More than 50% of the men who left Maywood in the fall of 1941 to defend the Philippines Islands a half a world away never returned. Killed in action, missing in impenetrable jungles, dead on the infamous Bataan Death March, or in an overcrowded and unsanitary POW camp, or on a Hell Ship to Japan or China, or as a slave laborer in a coal mine or steel mill, or any of an uncounted number of atrocities at the hands of their enemies and eventual captors – those who survived had been home for less than a year. The community still reeled from the loss, but the members of the American Bataan Clan wrote to the former leader of the Provisional Tank Group, Brig. Gen. R. N. Weaver, who was now Commandant at Ft. Ord in San Francisco. They had been informed that the US Army was donating tanks to communities. Could they humbly ask for one? Gen. Weaver’s response? “I will never forget the heroism of the men of the 192nd. Of course I will do everything in my power to see that you receive a tank.” Three months later, the tank arrived by train. On September 8, 1946, the tank was unveiled to the thousands who had gathered to pay their respects to the fallen and honor the survivors, who proudly marched in the annual Bataan Day Parade. On September 11, 2016, at 3pm, in Maywood Veterans Park at 1st Avenue and Oak Street in Maywood, interested members of the local community, community leaders, veterans, and descendants of veterans will gather again, as they have every year since 1942, to remember these men. The service will include color guards from various Veteran Groups and guest speakers. Master of Ceremonies will be MBDO Vice President, Edwin H. Walker IV. Colors will be presented by several area American Legion, VFW, and ROTC Color Guards. In past years color guard units from Maywood, Melrose Park, Berwyn, Hillside, Des Plaines, Chicago, Palatine, Elmhurst, Frankfort, Mokena, River Forest, LaGrange, Northlake, and many other Chicago and suburban cities have participated. A Rifle Squad Gun Salute will be provided by the American Legion Post #974 in Franklin Park, Illinois, Adjutant, Randy Thomas. Preceding the service will be patriotic music, beginning at 2:30 p.m.
Keynote Speaker will be Brigadier General Alicia Tate-Nadeau, Assistant Adjutant General of the Joint Staff, Illinois National Guard. General Tate-Nadeau, besides her long experience and service with the US Army and Illinois National Guard, has the distinct honor of being the first woman to have attained the rank of Brigadier General in the Illinois National Guard. The ceremonies will also include guest speaker Generoso D. G. Calonge, Consul General, Philippine Consul General in Chicago, and Maywood Mayor Edwenna Perkins. Other highlights of the Memorial Service include a dedication of new memorial plaques for some Maywood members of the 192nd Tank Battalion, the Monument Ceremony by the DuPage Chapter of VietNow Color Guard and a Wreath Laying Ceremony, featuring members of all branches of our Armed Forces, as well as related community organizations. Additional special guests scheduled to attend include members of the Village of Maywood Village Board of Trustees and other invited local community leaders. 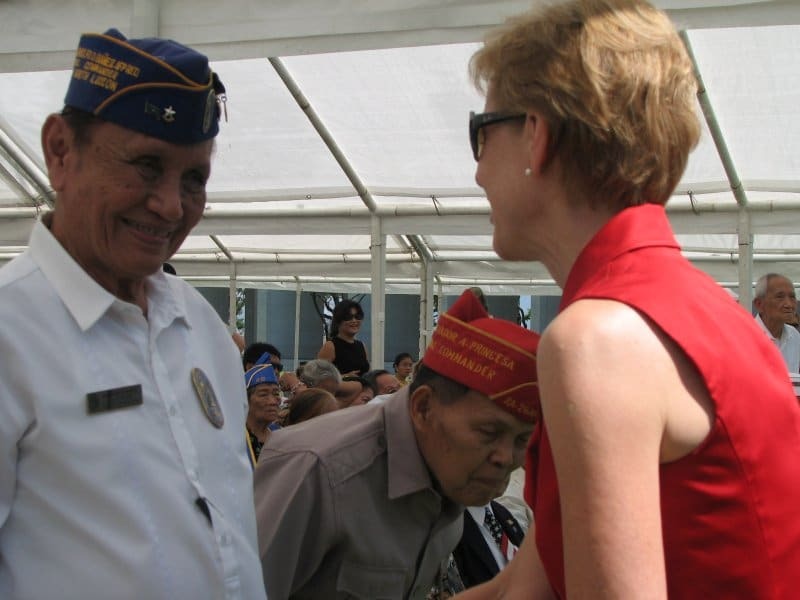 The Maywood Bataan Day Organization is dedicated to preserving the memory of Bataan Day and perpetuating the observance of Maywood’s Bataan Day on the second Sunday of September. Our modern mission includes supporting veterans of all wars and providing educational resources through our archives and our website (https://mbdo.org). The organization is a non-profit 501(c)(19) organization, that is supported by donations of time and money from the community, as well as relatives and friends of those who have served their country.